In my long experience with prepared foods, I’ve never before come across a frozen, microwaveable Chinese food that I was interested in trying. I don’t mean so-called Asian-styled chicken, but actual Chinese food dishes. And while my first foray isn’t exactly 100% authentic Chinese food, it’s the closest I’ve come so far, and that’s Tai-Pei General Tso’s Chicken. Seeing as how I’m a fan of General Tso’s Chicken in most restaurants, I thought this would be the perfect opening experience into prepared Chinese food. I’m sorry, but usually when there is clear plastic involved, there is usually a poked hole, or a peeled back. Never a fully shrink-wrapped item. Usually THAT means, take it out. Whether it did the meal justice or not, I erred on the side of caution and removed the plastic. 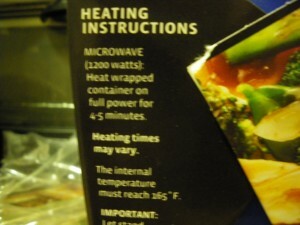 I was just worried that the plastic would wind up melting in the microwave. As that my microwave tends to be on the stronger side despite its age (more than 10 years), I opted to split the cooking time difference and go for 4 1/2 minutes. Afterwards, I allowed the container to sit for 3 minutes as per the instructions before diving in. Opening the box, I found that there was an apparent lack of chicken. I saw A LOT of carrots and some broccoli and other veggies, but didn’t really see the chicken. I stirred and finally found a few pieces languishing at the bottom. As can happen in many restaurants, the other ingredients VASTLY outnumbered the chicken. I know the directions said to dump the contents into a dish, but I couldn’t help but want to relive the experience of bachelorhood Chinese at-home dining by eating out of the container. No harm was done to the food by eating this way. 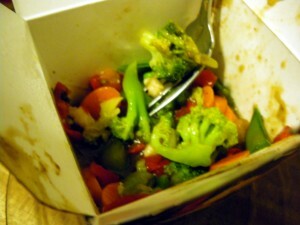 If anything, it kept the ingredients closer together and made for a more enrichingly experience flavor-wise. The sauce was definitely as advertised. 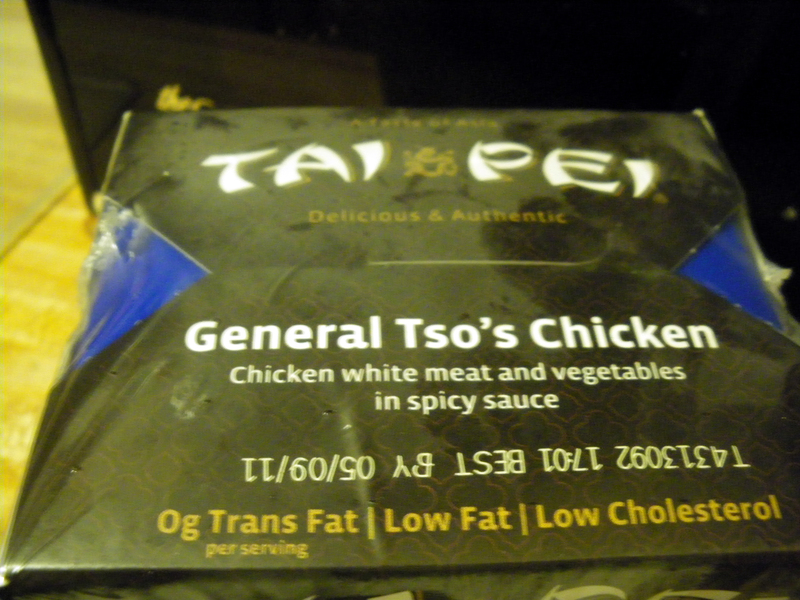 It’s one of the spicier sauces I have encountered with General Tso’s Chicken, this despite he very obvious absence of the spicy peppers usually included in authentic preparations of the dish. The spice factor was not exactly for the feint of heart, but had just enough kick to get enjoyers of spice interested. As I said before, there were A LOT of carrots in there. The good news, for carrot lovers, is that they were still crisp. As I was eating I noticed that it wasn’t quite cooked as well as it could have been, which I chalked up to my error with the packaging. 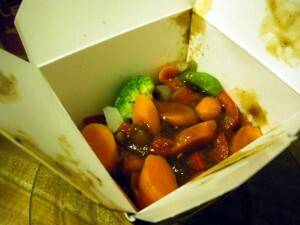 This, however, did not affect my experience as I am also used to eating Chinese food leftovers cold. In essence I got the whole experience in one sitting. Though I will probably have to try microwaving with the plastic wrap still on next time, with careful monitoring. The meal was very tasty, though not particularly filling. 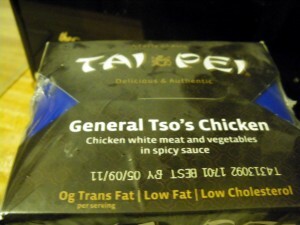 I wouldn’t necessarily say that it had a strong General Tso’s flavor to it, though it was still quite enjoyable. 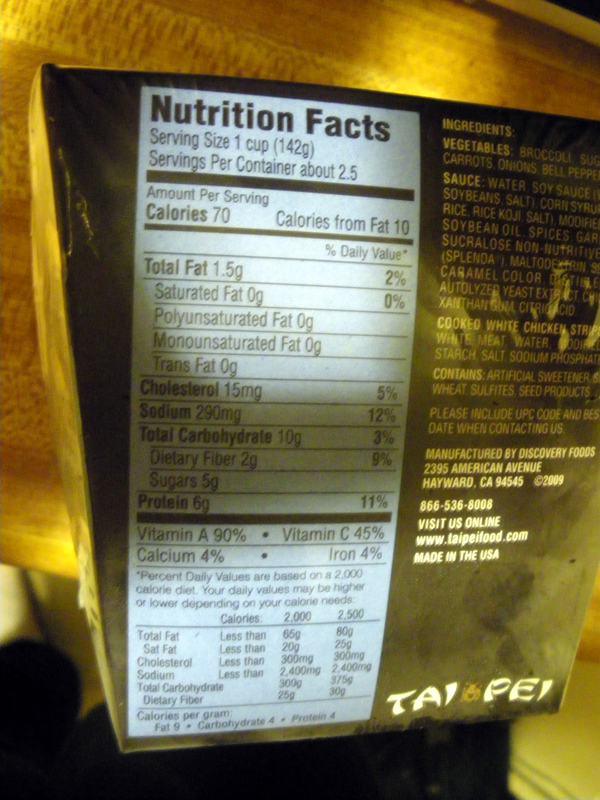 The sodium content might push a few people away (at 12% per serving, each container holds 2.5 servings), but that raises my favorite debate of what exactly makes a serving. In my mind, a serving should be a portion that is filling. A little over a third of that box wouldn’t fill a 5-year old. To be clear, the box wasn’t even filled, which is one more slightly disappointing factor. Usually when one orders Chinese takeout, the boxes are at least full. This portion was a little under 3/4 of the way full. Not an impressive portion, which brings me back to the fact that this just wasn’t filling by ANY stretch. Overall, it wasn’t bad. For a quick fix it will absolutely do in a pinch. But again, much like the Chi-Chi’s meal, if you’re looking for something filling, either be prepared to supplement with a side dish, or look elsewhere. It does help to leave the plastic on. 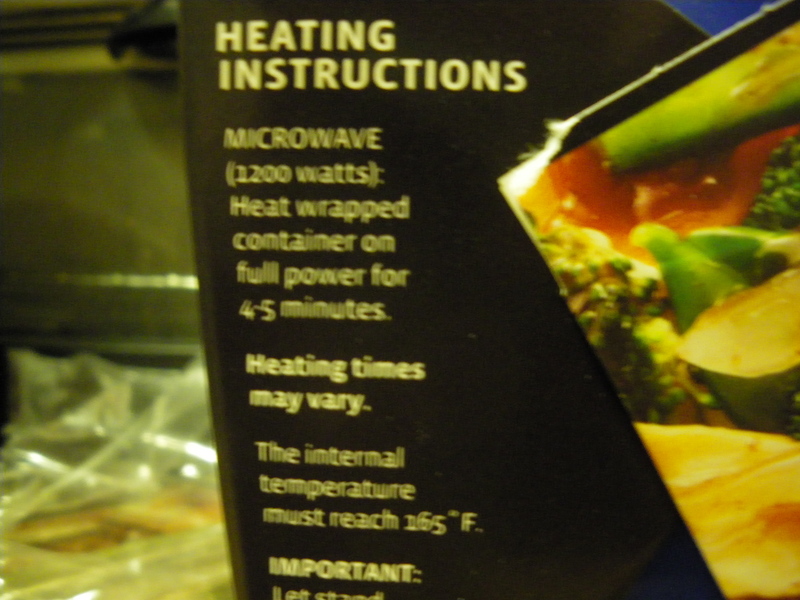 I have found with my microwave that a longer cook time is needed, by 2 minutes. 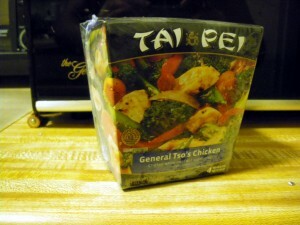 This is my favorite of the Tai pei brand microwave meals. The spices burn my tongue and throat making me think there is some kind of hot curry involved. I have yet to find a list of the actual spices they use. Whatever they are, it makes this meal delicious… and I eat the entire box.